I had a heavy sweet tooth this weekend and starting searching for some kid friendly sweet recipes. I found several that I decided I wanted to try. The Cool 'n Easy Strawberry Pie was the first recipe I wanted to make. The recipe was super easy and it was absolutely delicious. Creamy, but light. The kids had no complaint finishing their plate. They even asked for more. If you want something sweet, light and refreshing this is definitely the recipe to try. There are only four major ingredients to this recipe. 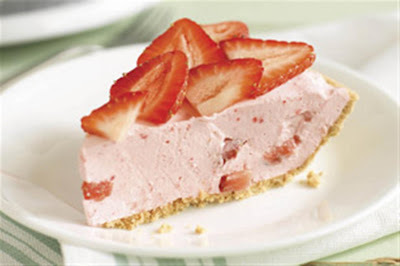 SLICE 1 cup strawberries; refrigerate for later use. Chop remaining berries; set side. Add enough ice to cold water to make 1 cup. Add to gelatin; stir until slightly thickened. Refrigerate 20 to 30 min. or until mixture is very thick and will mound. REFRIGERATE 6 hours or until firm. Top with sliced berries. Now doesn't that just look yummy? Going to make this today! Yum! To keep it fresh, I would.